It was over a year ago that I first saw this flying insect that had caught a large spider and was dragging it off somewhere presumably to eat. I’d never seen anything like it and I spent a while researching to try and work out what it was. At the time I thought it was a robber fly but now I think it’s a spider wasp! Robber flys do indeed prey on some spiders and other insects but the images really dont look anything like what I’d seen. 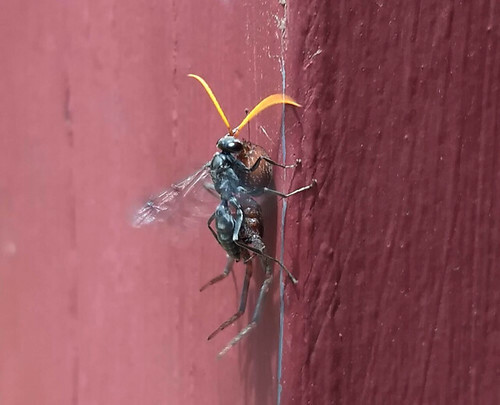 The spider wasp is a much closer match. 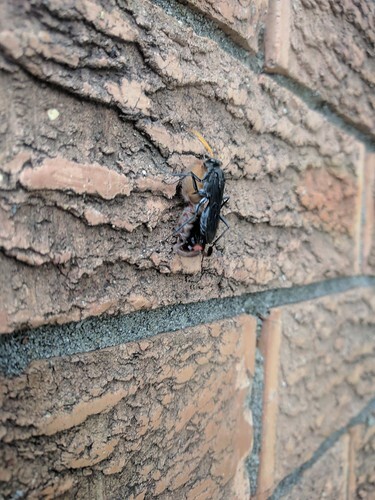 I’ve seen a few now, here’s some pictures of a smaller spider wasp with another decent sized spider. This particular one was struggling a bit with it’s prey. It even tried to fly a bit and only just managed it. Looking at the picture the spider could easily weigh more than the wasp! Spider wasps are known to chop off the legs of the spider to make it easier to carry. All the ones I’ve seen the spiders are missing their legs. Nature is brutal! Have you ever seen a fly catch a spider? 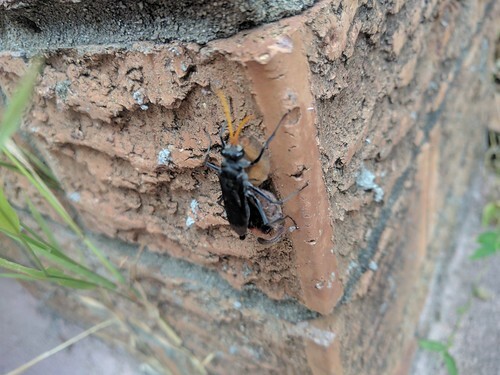 [update] – When I wrote this I thought the creature was a robber fly, now I think it’s a spider wasp. Here’s something you don’t see every day, a large fly like creature walking along carrying a sizeable spider underneath it! Now that’s a prey reversal! A bit like seeing a huge rat hauling a dead cat somewhere. 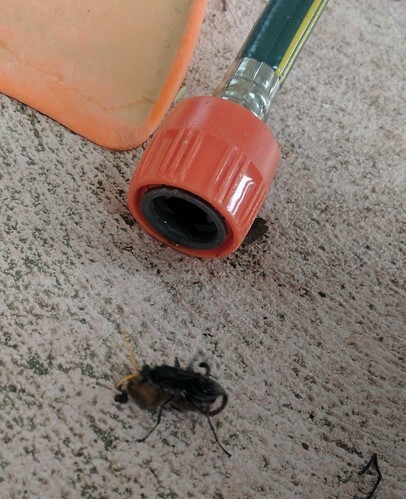 The fly was black, about 4cm in length with long legs that allowed it to carry the spider underneath it and still walk easily. The one I saw was on a mission to get somewhere, it walked quickly over the pavement for about 4m and then climbed a wall before I lost it. It had wings but didn’t try to fly, maybe the spider was too heavy for it. The spider was slightly longer than the fly and looked bulkier, all the spiders legs were gone and it was being carried inverted with it’s abdomen towards the front of the fly. Curious as to if this was normal I did some searching. The closest thing I could find that lives in the area is a robber fly. “Robber flies are large, bristly flies that catch their prey (usually other insects) mid-flight.” Robber flys are known to catch and eat spiders, the fly I saw didn’t have the same enlarged powerful chest as the robber fly photos on the articles. It looks like there is some variation between robber fly species so maybe it’s just a different species that I saw. It was moving fast and I only had my phone on me so I found it hard to get a clear picture, but you can see the size of the spider compared to a garden hose and a house brick. The spider looked like a huntsman, I’m not sure how the fly would have killed it and removed it’s legs, or maybe it found the spider like that? They’re back, and they still have an appetite for destruction! 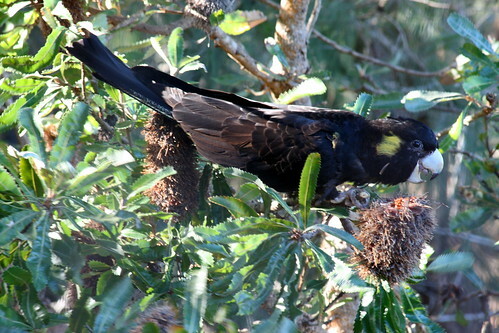 Every year about this time the black cockies visit for a day or two, tear up the Banksia trees in our yard then leave. Sulphur Crested Cockies are here in abundance year round, Black Cockies only visit for a few days per year, sometimes I miss them altogether. 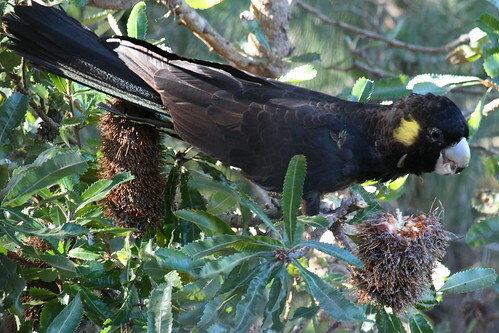 Yellow tailed black cockatoos are larger than their sulphur crested cousins, they have a louder and more piercing shriek too. A few days before I saw the black cockies this year I heard a chilling shriek in the valley after dark, for a moment I thought it sounded like a person in distress, but I figured it was more animal like. After I saw the Cockies I now think that’s what it was. This year the black cockies visited on July 23rd, a few weeks earlier than previous years. During the big storms a few weeks ago I was lying in bed at around 11pm just about to ready to go to sleep when a loud and prolonged cracking sound started coming from just outside the bedroom. 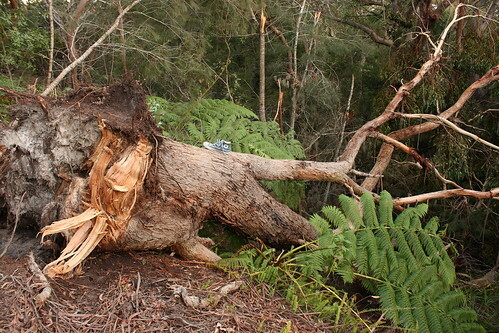 I knew right away that the large Sydney Peppermint gum in the back yard was falling over! I jumped up and tried to get to the window but it was pitch dark and storming, I couldn’t a thing. As the cracking continued I was terrified it was going to fall on the house, luckily it went the other way and ended up taking out a sizeable swath of bush and other trees as it came down. Phew! As the name suggests Sydney Peppermint gum is found in the Sydney basin, it ranges from the extreme south NSW coast up to the central north coast. Flowering time is early summer. It was a shame to loose the tree, it was a large feature of the back yard. 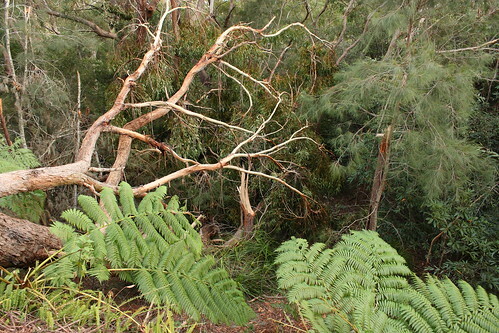 The pair of kookaburras who used to sit in it came and sat on the toppled tree no doubt wondering what had happened. Fallen Sydney Peppermint Gum. Sneaker for scale.